Attendees arriving to Peter Tea’s lecture in September were immediately greeted with Peter’s unique approach to the evening. 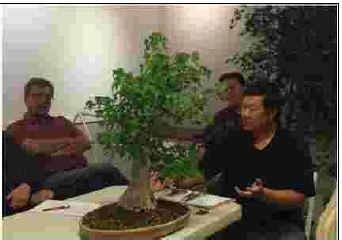 He brought four trees and had them on four tables, which he moved among and incorporated into his discussion. His focus: what can be done now to junipers and deciduous trees, with two types of junipers, a Seiju Elm, and a Trident Maple as his subjects. He covered both the removal and cutting back of branches, and signs to look for to make sure a tree is ready for those procedures, like runners (or tip extensions on junipers) and the hardening off of the growth. Among the vast amounts of information Peter provided, some of the particularly critical tidbits were that Sierra Junipers do not like pinching (commit to cutting entire branch portions rather than growth tips) and that California, Sierra, and other native junipers cannot be cut back too hard. Even after you have successfully induced back budding on those, the runner growth needs to be cut back in stages to avoid weakening these trees. Wait for the desired back growth to get good and healthy before cutting the runner away entirely.